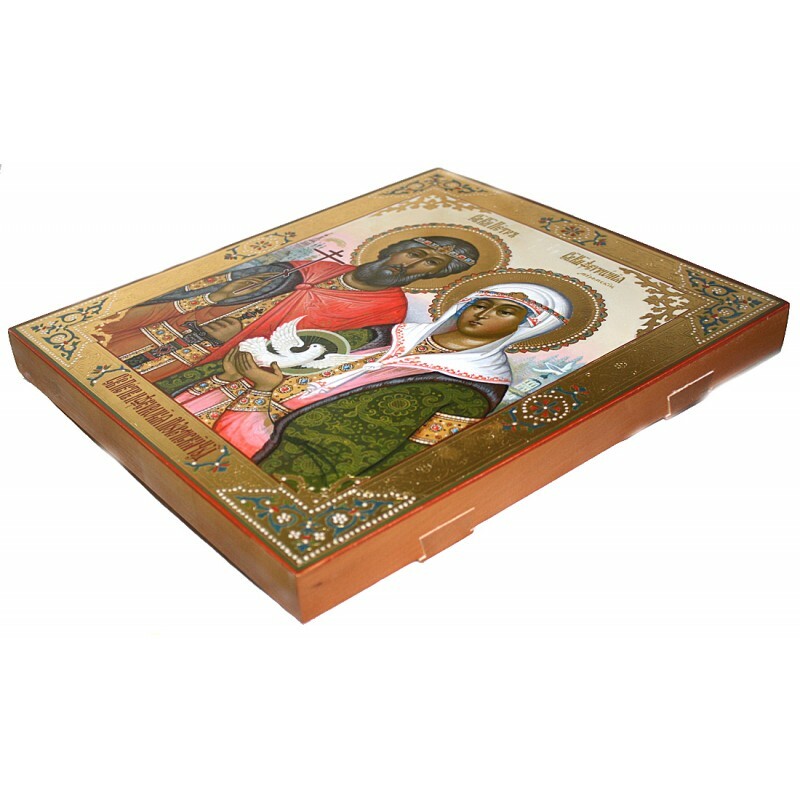 This nice icon was painted by the famous Mstera Master Shirokov Anatoliy. 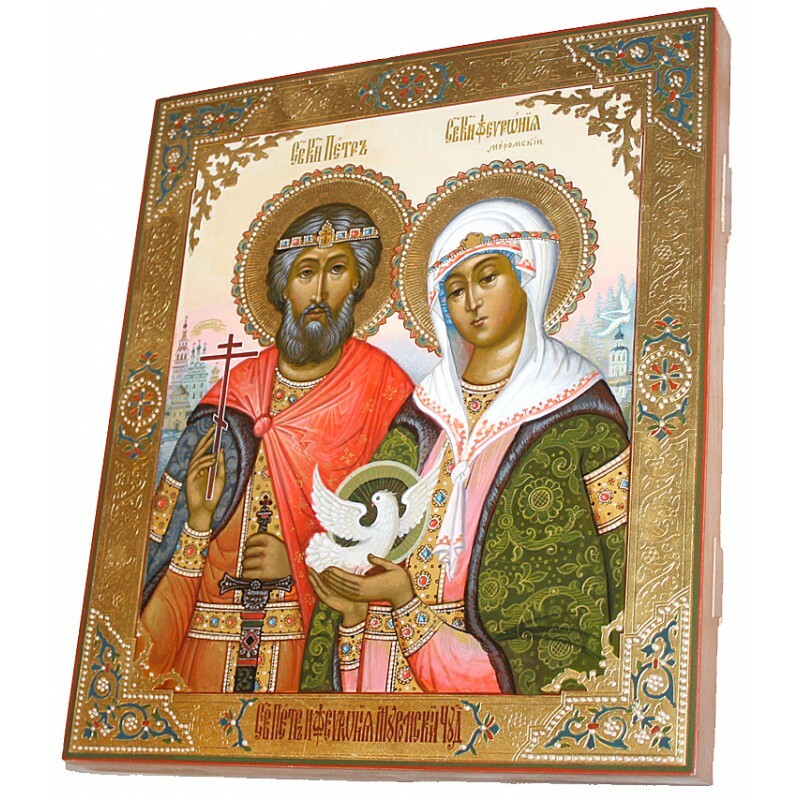 The Day of Saints Peter and Fevronia since the days of Kievan Rus and until 1917, was broad celebrated in Russia because it was believed that the saints Peter and Fevronia are the patrons of marriage and family, as well as the symbols of love and fidelity. On this day it was common to go to church, where people asked for love and family grace. Once prince Paul is disturbed, as a guileful snake has gotten into the habit of visiting his wife disguising himself as the prince. His wife finds out that the only man who can defeat the snake with a magic sword is Paul's brother, Peter. Peter defeats the snake, but its blood spills on him and his body is covered with aching scabs. No doctors can help, but suddenly Peter hears of Fevronia, a wise young peasant maiden, who promises to heal him. As a reward she wants to marry Peter. 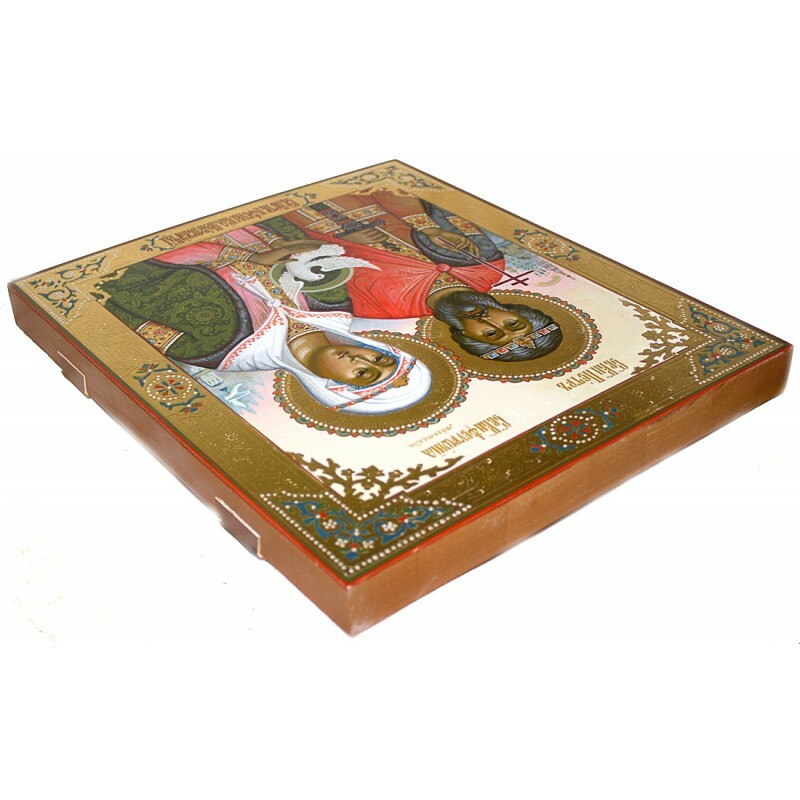 When healed, he does not keep his promise and instead sends rich gifts to Fevronia. However, soon Peter's body is again covered with scabs. Fevronia heals him again and this time they get married. 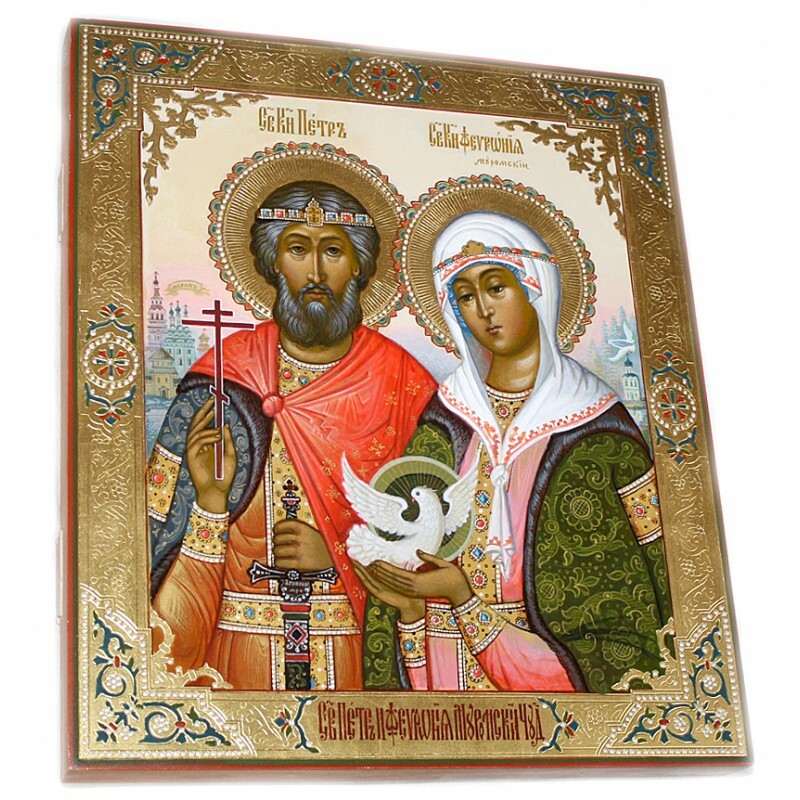 Prince Paul soon dies and Peter and Fevronia come to reign in Murom. The boyars are unhappy to have a peasant woman for princess, and they ask Fevronia to leave the city taking with her whatever riches she wants. Fevronia agrees, asking them to let her choose just one thing. The boyars find out that the wise maiden's wish was to only take her husband, so Peter and Fevronia leave Murom together. The city remains without a prince. 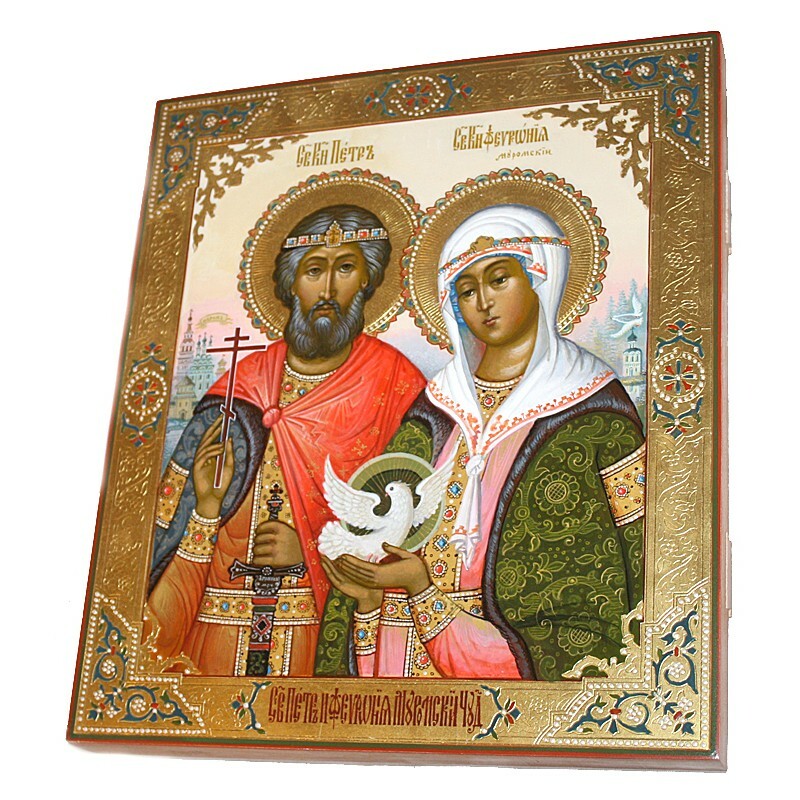 The boyars start strifes over the reign, Murom is in havoc, and finally Peter and Fevronia are asked to return. They reign wisely and happily until their last days, which they spend in monasteries. They know they will die on the same day and ask to be buried in the same grave. 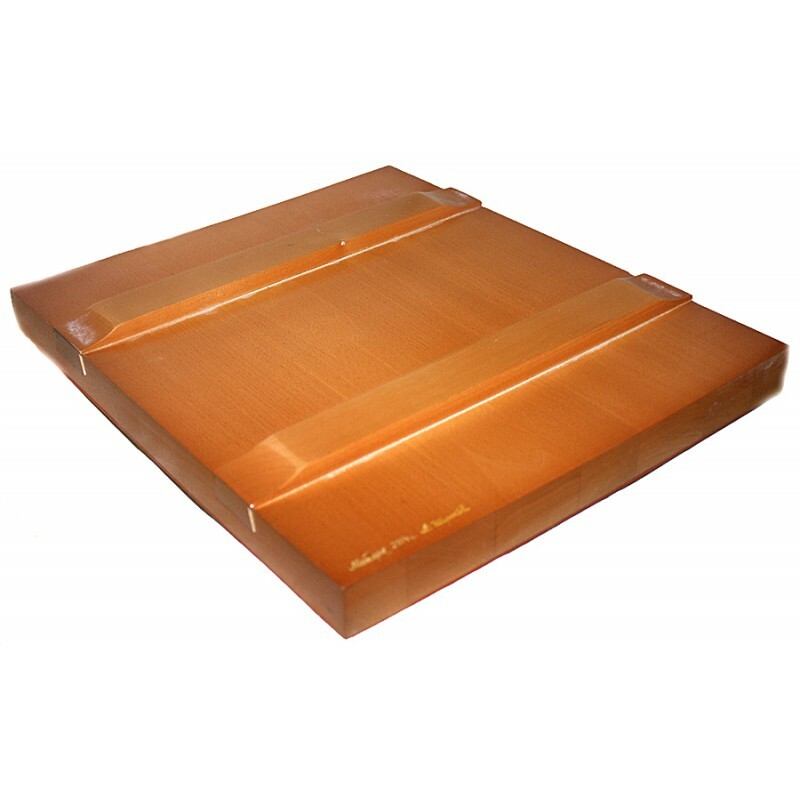 The Russian Orthodox tradition does not allow for a monk and a nun to be buried together, but the bodies are twice found to disappear from the original coffins and finally remain in the common grave forever. In 1547 Peter and Fevronia were canonized and the tale started to be interpreted as a hagiographical piece. 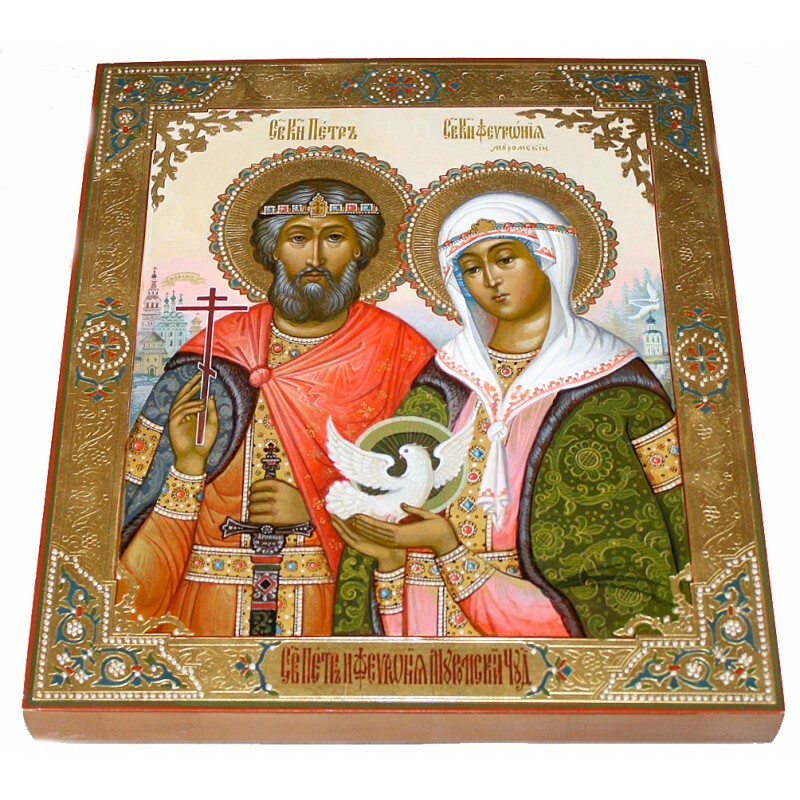 The Day of Saint Peter and Saint Fevronia also known as Day of Family, Love and Faithfulness, the Orthodox patrons of marriage, was officially introduced in Russia in 2008 on 8th July. It's symbol is a white daisy. 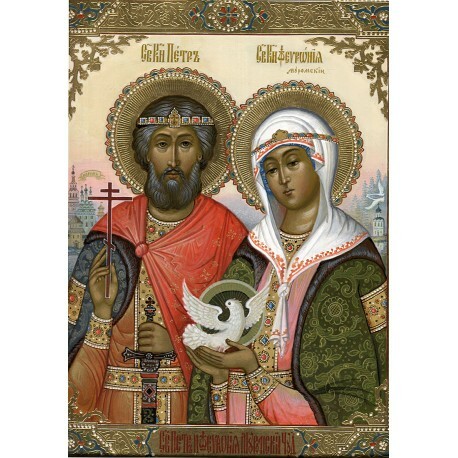 Also,the Tale of Peter and Fevronia served as one of the sources to the Nikolai Rimsky-Korsakov opera The Legend of the Invisible City of Kitezh and the Maiden Fevroniya. 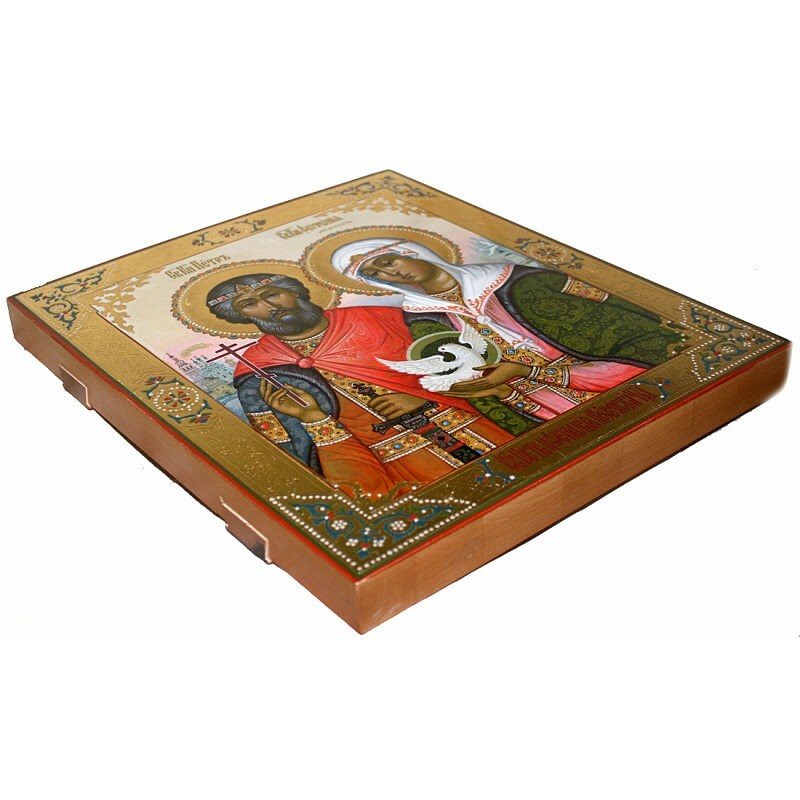 This icon has been painted in the village of Mstera on the wooden base. 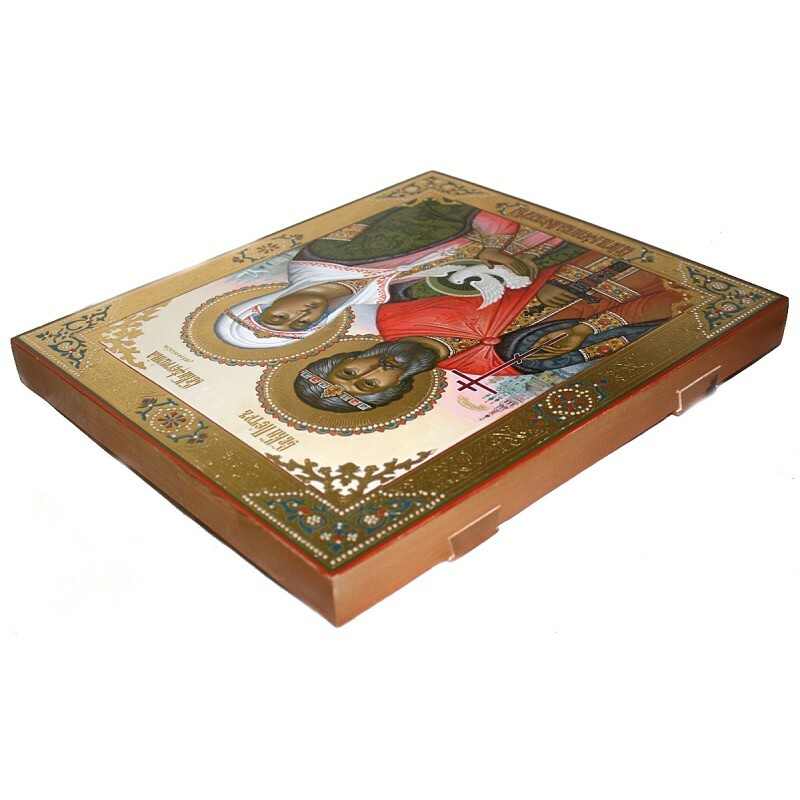 According to the tradition of Russian icon painting, the work is painted in egg tempera paints and detailed with brilliant gold paint. 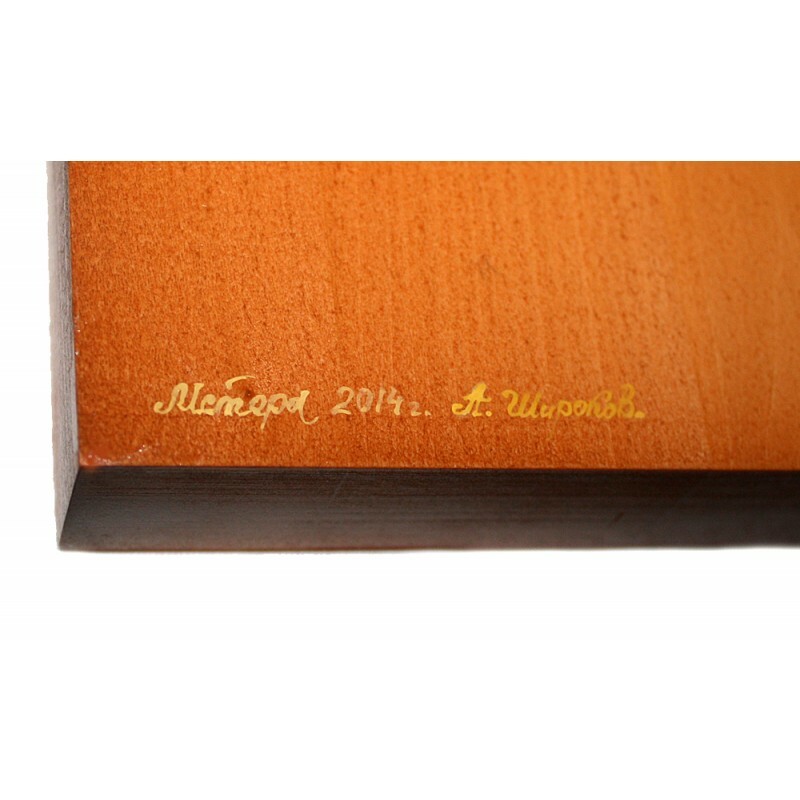 The leaves of gold is also used to create a frame around the depicted icon.